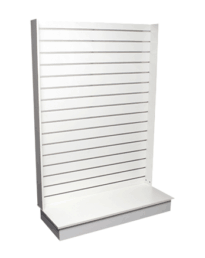 Premium quality, well constructed and built to last, our slatwall display gondola stands are the perfect shop fitting solution for all kinds of retail stores that stock medium weight products. 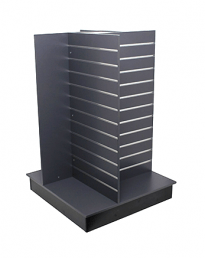 These flexible units can be fitted with a wide range of accessories such as display hooks and traditional retail shelving to sell anything from stationery to clothing accessories. 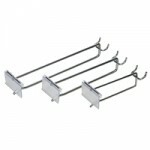 They come in a range of styles and designs so retailers can choose the product that most fits their store environment. 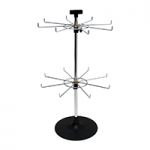 These affordable gondola display units can be placed anywhere throughout the store to give customers a great browser-friendly shopping experience. 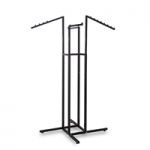 What are slatwall display gondola stands? 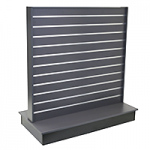 Slatwall gondola units are free-standing displays fitted with horizontal slat panels which can accommodate a range of shelving and accessories to showcase goods in your store. The slat panels are separated by a series of grooves that are 100mm apart. 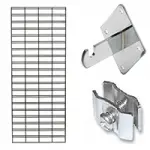 These grooves are fitted with 1mm thick aluminium inserts into which can be slotted brackets for slatwall shelving (such as melamine, metal or glass shelving) as well as accessories such as metal hooks or acrylic display bins. 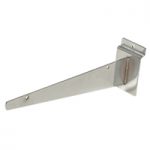 The attachments slide in and out of position, meaning that you can change store displays around with ease and without the use of drills or screwdrivers. Panels are made from thick medium density fibreboard (MDF) and finished with melamine (available in a variety of colours) so all products are both sturdy and attractive. The gondola displays are free-standing so they don’t have to be attached to walls. 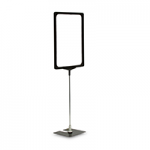 You can place single-sided units up against walls or have double-sided, 4-way stands or H-stands placed anywhere on the shop floor. This gives retailers great flexibility when it comes to planning their store layout, enabling them to arrange the units in rows, grids or even into a more free-form design. 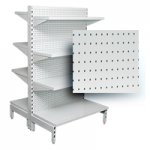 As these units have a good load capacity, they can be used to display multiple rows of stacked goods on shelves, such as books or supermarket products, heavier products such as hardware tools, or hangsell displays where multiple items are placed on fitted hooks or prongs. 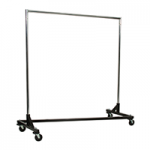 Where can slatwall display gondola stands be used? 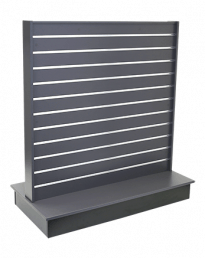 These slatwall gondola systems can be used in most types of retail store, from upmarket boutiques in busy shopping centers to small independent retailers on cobbled side streets. 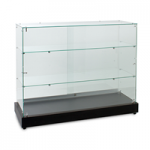 If you sell products of small to medium size and weight that can be displayed on shelves, in containers or by hangsell, then these display units could be the perfect solution for you. Chemists – pharmacy stores sell a varied range of products of different shapes and sizes with a quick turnover of stock, so they can benefit from the ease-of-use and flexibility. Medicines and hygiene products can be stacked on traditional shelves with packaged goods displayed on hangsell and loose items in dump bins. 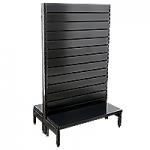 Shoe stores – can display footwear products on individual acrylic shoe stands that slot easily into place on the slat panels to create a wall of shoes, trainers, sandals, etc. 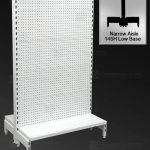 Hardware stores – the strong load bearing capacity of the slatwall units means that heavier tools can be displayed effectively while smaller items can go on attached hooks and containers. 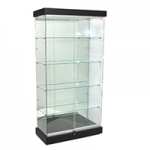 Gift shops – the slatwall design adds a neat attractiveness to stores which can utilise the variety of display options and accessories to sell gifts of all shapes and sizes. 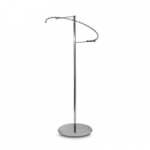 Clothes stores – from discount stores to high end fashion stores, slatwall displays can be effective for garments which can be folded neatly on elegant glass or melamine shelves, or hung on hooks, waterfalls or faceouts. 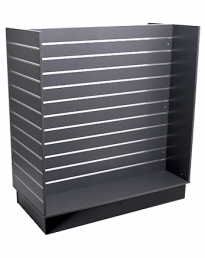 Newsagents – can utilise angled magazine racks and and acrylic shelving to display daily newpapers and regular publications in a more browser-friendly fashion. 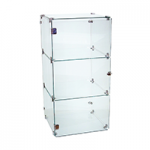 Electronics stores – acrylic display stands are available in different sizes to accommodate mobile phones, tablets and laptops, while packaged products can be arranged in a neat hangsell display. 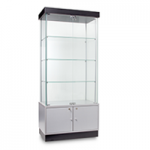 Single-sided unit – with a slat panel display on one side and a 505mm base at the bottom. 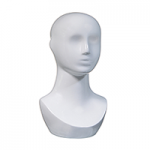 This product can be placed free-standing against a wall or in a window display. 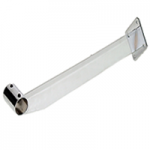 With a display panel size of 1600mm (height) and 1250mm (width) and available in three different colours. 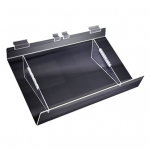 Double-sided unit – also known as a middle unit, the double-sided unit has usable display panels on both sides and a base that extends on either side. 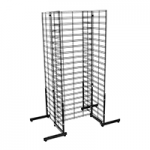 These units can be placed anywhere in the store and can be arranged next to each other to create aisles. 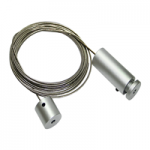 Available in heavy duty design in different sizes and colours. 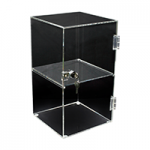 Also available as a unit with lockable storage space underneath. 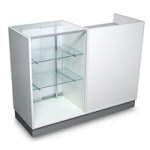 H-unit – similar to the double-sided unit but with added end panels to create an H shape. 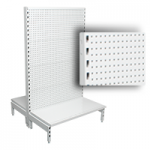 End panels are both operational slatwalls for extra display space. 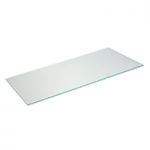 Available in standard 1200mm panel width and extra-large 1800mm panel width in different colours. 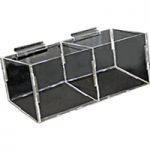 4-way units – these multi-sided products consist of four separate walls arranged at 90-degree angles on a single base. The design allows for additional display space and gives store designers additional freedom to be more creative and innovative with in-store arrangements. 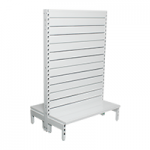 Units are available in standard size with 600mm (w) x 1200mm (h) panels, and in extra large with 1200mm (w) x 1200mm (h) panels. Available in different colours. 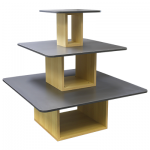 Practicality – one of the great benefits of these displays are their ease of use. 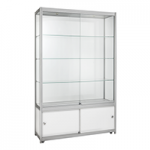 Everything is very easy to assemble, the accessories slide in and out of place and are simple to use, units are easy to keep clean and tidy, and as they are free-standing they can be moved around the store easily. 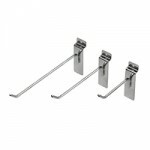 They also make the browsing process very straightforward for customers. 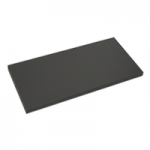 Durability – the finished MDF panels are tough, scratch resistant and will last many years if properly looked after. All of the units are fitted with a strong base and can cope with heavy loads, either large quantities of products or individual heavy goods. 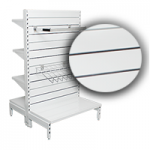 Flexibility – the variety of options offered by these units is extensive, with accessories such as shelves, prongs and baskets giving stores possibilities of displaying numerous goods in a variety of ways. 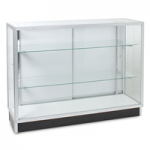 The ease in which displays can be rearranged means that whole stands can be transformed in minutes, making these products ideal for busy stores with a quick turnover of changing products. 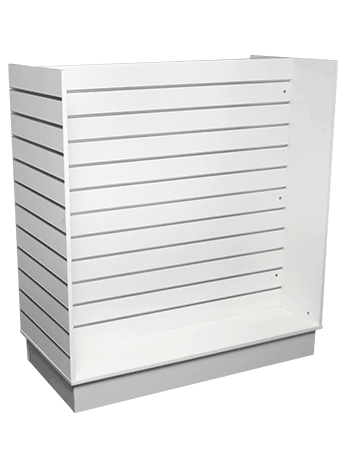 Attractiveness – the neatness of the slatwall design makes stores look very organised and elegant. The finished panels look eye-catching on their own, which takes the pressure off stores feeling that they have to keep every inch of space crammed with stock to cover up dull wall space. 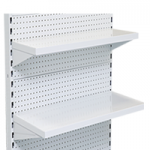 Shelving is easy to clean too, so dirt and dust is not a big problem. 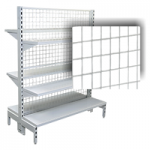 Saves space – slatwall displays allow retailers to display large quantities of varied goods on wall and aisle units, which reduces the need for large, heavy containers filling up shop space. The sleekness of the gondola units means that they can be arranged in the store in a way that maximises browsing space. 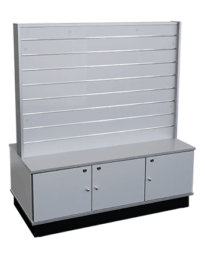 Affordability – gondola displays are one of the more affordable shop fitting solutions on the market. 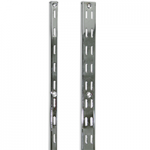 As slatwall products are made with reasonably low-cost materials, prices can be kept low. 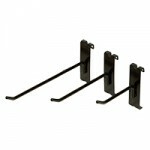 This makes slatwall gondola units a popular choice for all types of retailer. 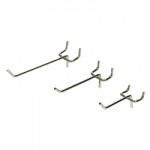 Metal hooks and prongs – these can be slotted into place to create hangsell displays for packaged goods, jewellery items, clothing accessories such as bags and belts, as well as many other products. 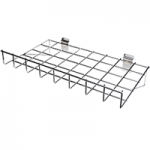 Metal, melamine and glass shelving – traditional shelving of varying sizes can be placed upon brackets slotted into place to create either rows of stacked goods (for supermarkets, grocery stores, etc.) or more spaced out displays favoured by gift stores and boutiques. 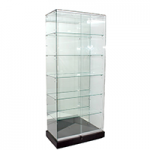 Acrylic stands and shelves – these are available in different sizes to cater for products including shoes, mobile phones and laptops. 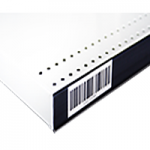 They can be individually slotted into the units to showcase sole products. 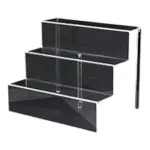 Angled shelves and stands – available in acrylic and metal, perfect for displaying flatter items such as books, newspapers and magazines in a more browser-friendly way. 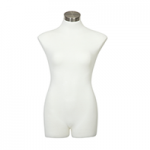 Faceouts and waterfalls – can be used for hangsell display of clothing such as t-shirts, tops, skirts and trousers. 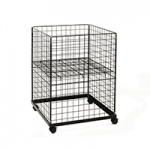 Display bins and baskets – available in acrylic and wire metal, a great solution for those loosely displayed awkwardly-shaped smaller items. 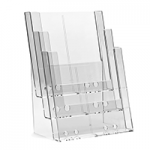 Acrylic brochure holders – for neatly displaying flyers and information leaflets. 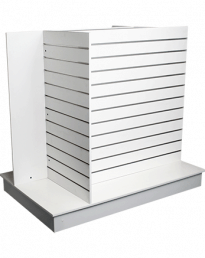 If you are looking to purchase shop fitting products including gondola units or accessories, or simply have a question that you’d like answered, get in touch with Shopfittings Direct by calling 02 9608 5122 or emailing sales@shopfittingsdirect.com.au. We can help advise you on improvements that can be made to your store as well as supply you with an extensive range of contemporary shop fitting and shelving solutions. Our customer base extends all across Australia so it doesn’t matter where you are located in the country.